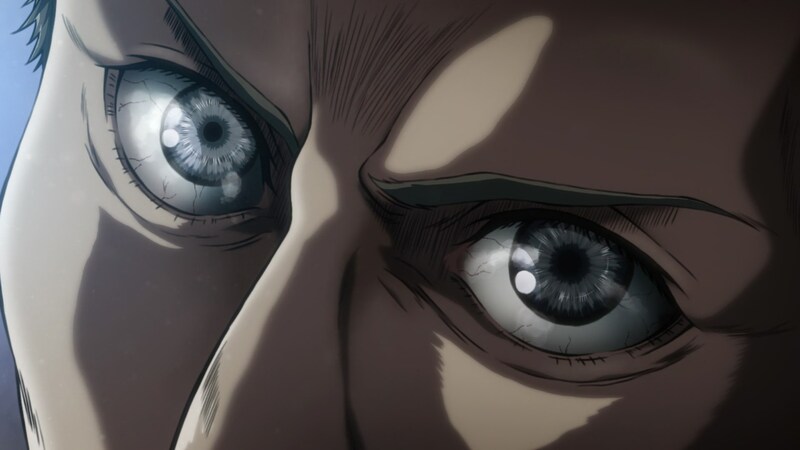 Attack On Titan’s sequel has finally arrived, and its many fans requested us to take a look at its production. These articles will be examining its staff, the creative process, the animation itself and even some technological advances. This time, special focus on studio WIT’s unique makeup animation process! — Not much of an introduction is needed for a sequel to a hit of titanic proportions. There’s one preliminary thing I want to get out of the way though, and that is the slight confusion over the directional roles on the series. I saw many comments pointing out that Tetsuro Araki was no longer directing the series, followed up by mentions that the show didn’t change much in spite of that. The reason is clear: the directional crew, as well as most of the core staff in general, is exactly the same. It’s true that Masashi Koizuka has been promoted to director (監督), while Tetsuro Araki is now chief director (総監督). 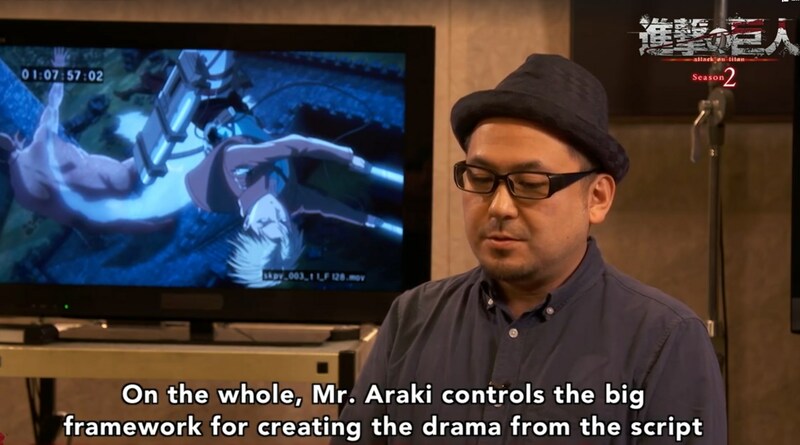 What you have to keep in mind though, is that Koizuka was already assistant director (助監督, alongside Hiroyuki Tanaka who has kept that role) so his input had always been important. He has explicitly stated that he doesn’t want to disappoint existing fans, and Araki still outranks him, so you shouldn’t be worried – or hopeful – about a new vision taking over the series. — As a consequence of that, the first episode was storyboarded by Koizuka rather than Araki. They’ve talked about how they plan to split their workload, and that follows the pattern you would expect from a series with those two roles; the chief director makes the important narrative and structure decisions, basically shaping the spirit of the work, and the director oversees its actual creation. 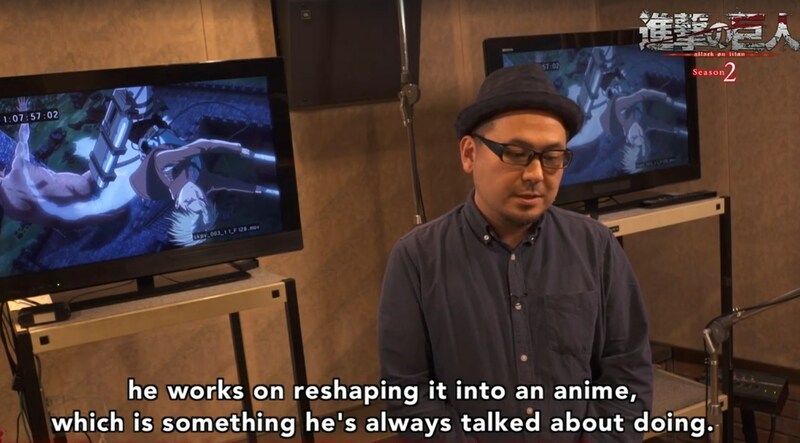 Araki has mentioned that Koizuka has more of an animator’s mind than he does, which makes him more apt to conceptualize Attack on Titan’s dynamic action. 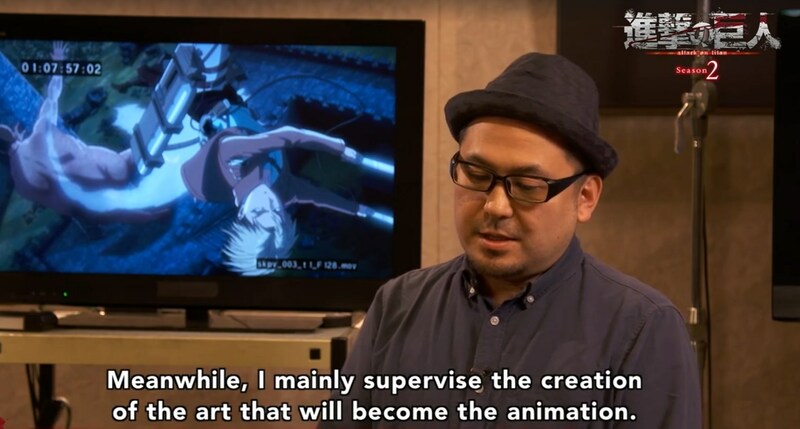 He actually can animate too despite having taken the producer route into the industry, but let’s leave Araki’s key animator adventures under the pen name Saburo Mochizuki with his pal Takayuki Hirao for another day. To put things plainly, Koizuka’s boards lack the constant striking shots Araki pulls off, but he’s better at boarding sequences that are meant to impress (and can!) while in motion. Again though, Koizuka had already storyboarded and directed way more episodes than Araki in the original series anyway. This seems like a sensible evolution and not that much of a change. Makeup animation/special effects for living beings being applied vs a regular shot. 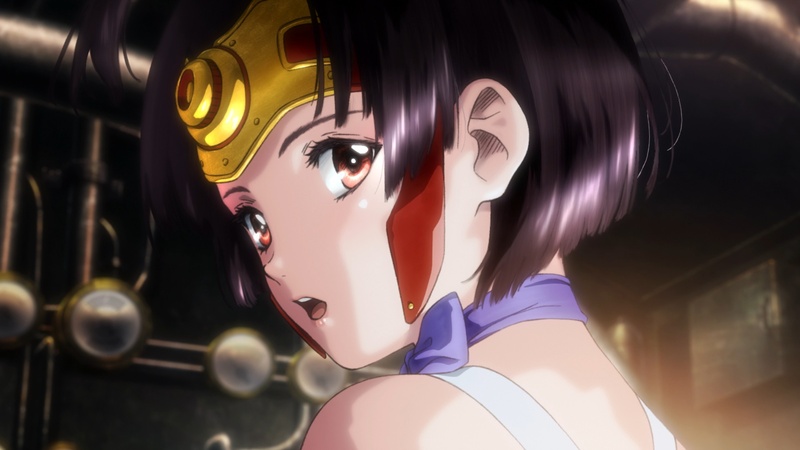 — If you paid attention to Kabaneri, you might know that at the time studio WIT heavily promoted their new makeup animation process. Within the standard production cycle, once the animation is inbetweened and scanned (in case it wasn’t digital to begin with) it has to go through many hands: the painting team, special effects crew, then the photography department to finish the composite alongside the other materials. With the makeup animation, you have a select group of digital artists stepping in since the inbetweening process to give the animation tons of extra detail and illustration qualities that weren’t originally present. This is a complex process that could only be applied to a very small number of cuts, which meant a handful of scenes were simply much better than the rest. Contrast is a powerful tool, and I don’t believe that sudden spikes in quality are something to complain about (the other way around, if anything! ), but in this case it destroyed the harmony. Static scenes where that process was more feasible than in motion seemed to belong to a different series, and it simply made the rest of the series look barren; perhaps something it actually was responsible for, since the animators were aware someone might come later to add detail to their scenes – why do it themselves then? This was an interesting idea, but Kabaneri’s execution left to be desired. 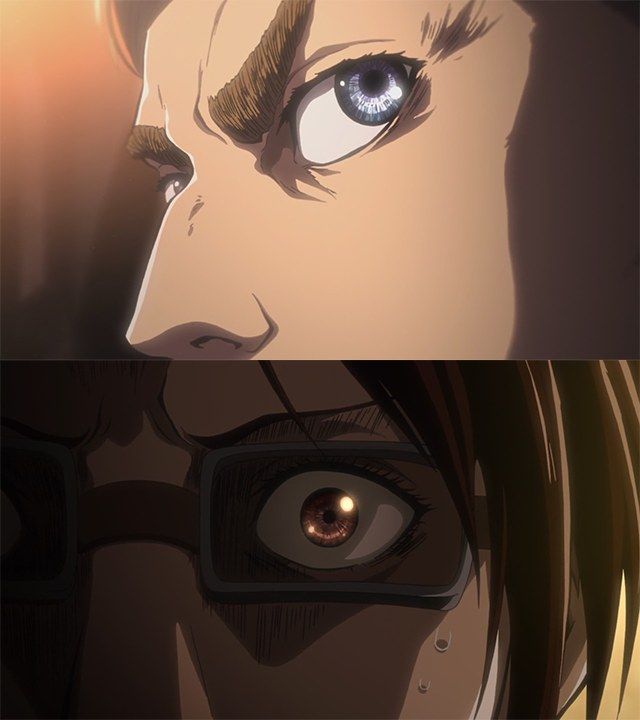 — Now the makeup animation is back for Attack on Titan Season 2, albeit with a different name and more restraint. It now has the way less catchy title Special Effects For Living Beings (生類視覚効果), led by the Special Effects For Living Beings Leader (生類視覚効果班長) Chie Yamazaki. The team she assembled is much smaller this time around, mostly including people who already worked on Kabaneri, and as per her words their aim is to make the titans feel more organic. I get the feeling that they’re also adorning some eye closeups, which is apparent during some slightly awkward switches to/from normality. 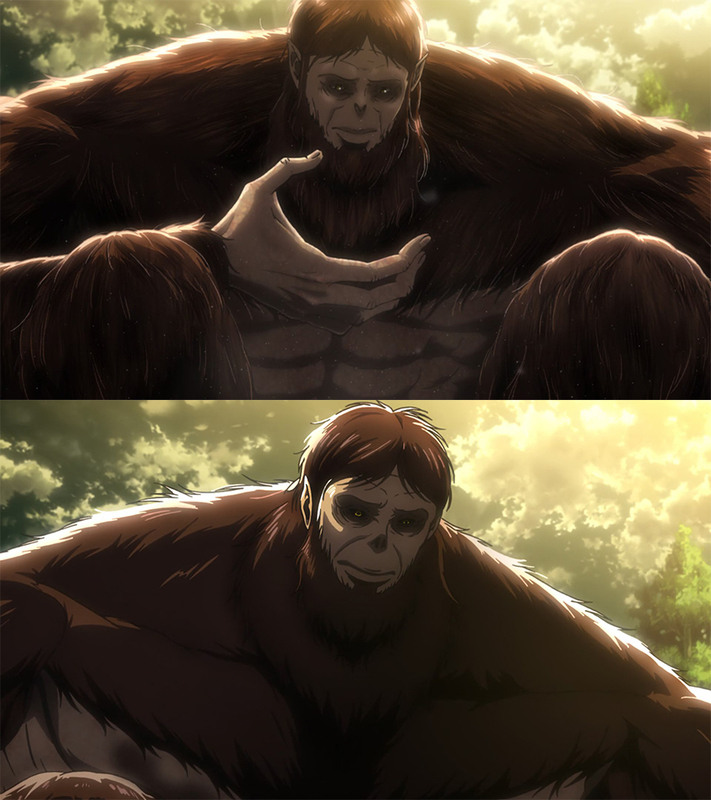 Their work is at its most apparent during the scene with the ape titan, since they made its fur look very fancy during certain shots. Again, this creates a weird contrast when there’s two similar cuts back to back and only one of them has those effects applied, but all in all I think that this is a vast improvement over Kabaneri. The makeup animation doesn’t take over the entire shot and the general state of the drawings is good so far, so these moments feel impactful yet reasonable, no longer just a weird gimmick but a genuine tool. There’s room for improvement of course, but they’ve done well so far. — Now let’s look at the animation itself, since action is still one of the main draws of the series. 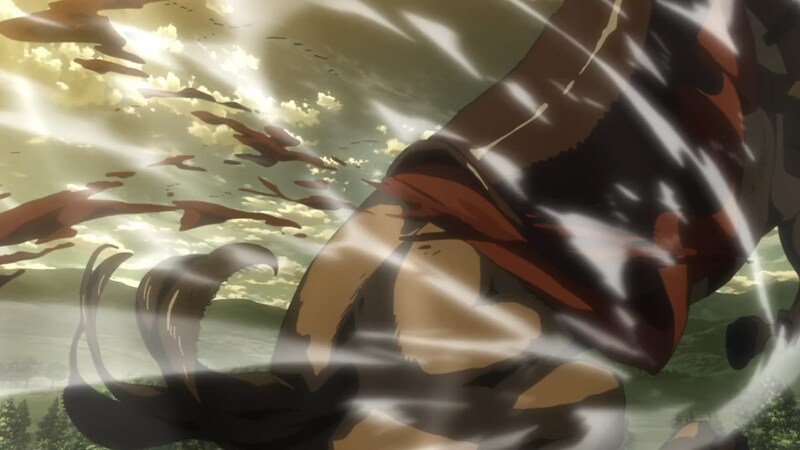 The undoubted highlight goes to the action animation director Takuma Ebisu and the horse throw he personally animated. Many fans speculated about it being Arifumi Imai’s work, but if you pay attention there are plenty of tells of Ebisu’s hand; before the high octane cuts even happen, this sword smear is already a strong hint. It’s not as noticeable since they chose to lower its opacity, but these arcs left by blades and flat and soft smears in general are something Ebisu loves. The effects are also strong tells: masses of smoke with holes in them, circular formations, and these thinner threads of FX. Imai on the other hand animated this skating bit, which doesn’t rank amongst his best work but is flashy nonetheless. He has his own episodes to worry about later, plus he did some unbelievable work on the opening, so this is more than acceptable. — Despite the larger staff list, this was a much more conservative production effort. Understandable since it was an episode mostly dominated by flashbacks, and also caused by the core staff structure; there are 3 chief animation directors as well as 3 action animation directors, and this time it was the least spectacular duo in charge. Next week on the other hand it should be the turn of Satoshi Kadowaki and Arifumi Imai, which is as strong as this series can get. Look forward to that! — Speaking of staff, it’s easy to notice the unusual overlap between the first two episodes. The series director Koizuka storyboarding both of them is par for the course, but you generally don’t see that many key animators working consecutively at the beginning. 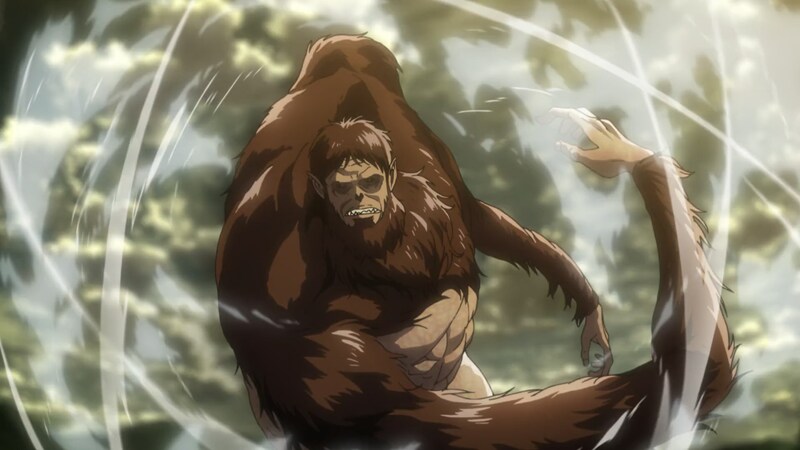 It’s a positive factor that allows this, but there are some caveats; Attack on Titan’s schedule this time around is much more reasonable, which is kind of a given considering how long it’s taken to happen for a sequel that was actually immediately greenlit. So despite being far from efficient, as they’ve apparently struggled a lot on a fundamental structure level, they’ve been able to animate these initial episodes over a longer period of time – which allows people to work on them both just fine. 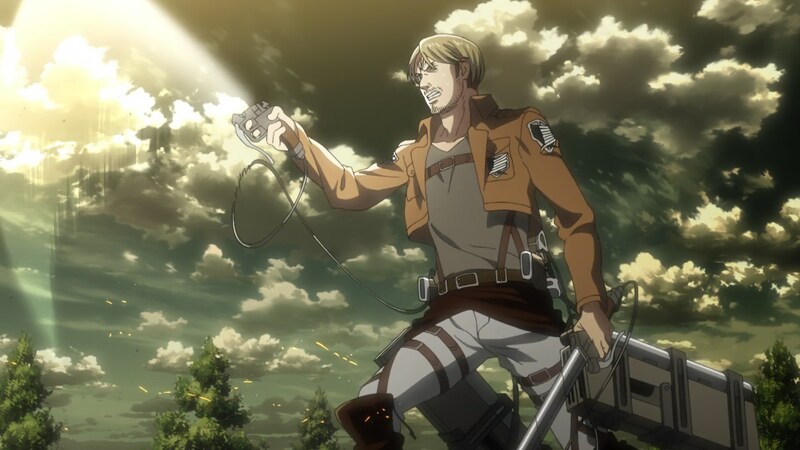 For the record, the first episode of the series was wrapped up right at the end of 2016, and the second one was getting key animated around January. If things don’t fall apart too hard, which is often too much to ask from WIT, the series should be just fine. — But how come they were only animating the second episode when the promotional videos showcased footage from much later, fans of the manga might ask. It’s important to keep in mind that the production of episodes overlaps, it’s not as if they’ve got to wait until the previous one is finished to start with the next. But more importantly here: pre-animated PVs. A practice that WIT is very fond of, as those who follow production matters likely know. Ideally, promotional videos are edited using naturally finished footage that looks appealing, but you can also choose to animate certain bits in advance and give them special treatment. And if your actual production can’t live up to that, which it almost inevitably can’t if you have to rely on tricks like that, then you’re selling yourself with misrepresentation. There are trailers explicitly featuring unique footage, but things become awkward when it’s material that will be covered by the actual series. Mind you, this isn’t always a negative – Mob Psycho’s excellent PV was preanimated by Yoshimichi Kameda himself, and those cuts were mostly reused within the show later…because they actually put together a show spectacular enough that they fit just fine. 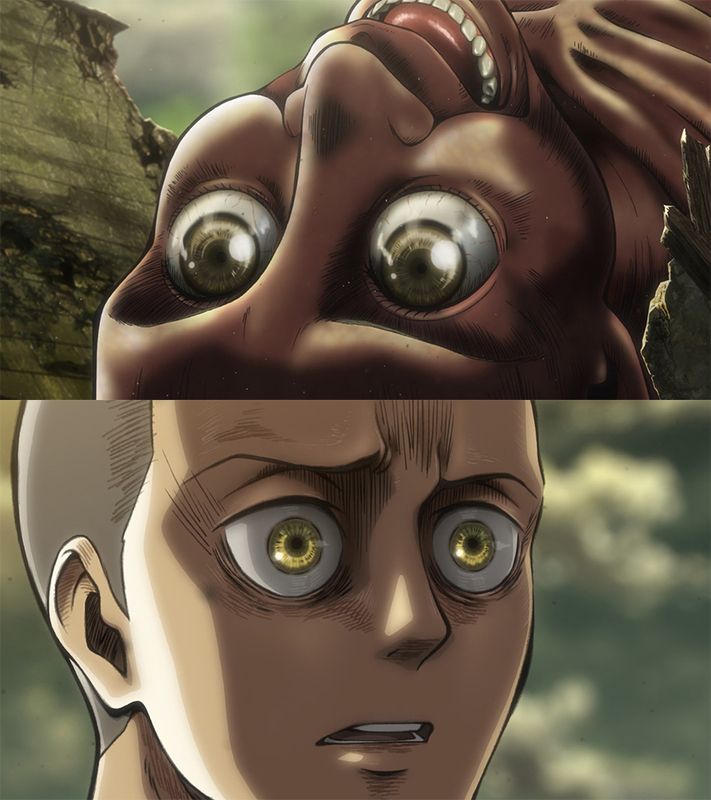 Will Attack on Titan manage that? No, but at this point it’s hard to mislead its fans. Anyone who cares about these matters is already aware of the huge gap between the show’s action at its best and the downtime. Striking instances of makeup animation usage. — These shots entirely confirm my suspicion that the makeup animation – which I’m going to keep calling that despite the new role, since it’s what the person in charge does anyway – is also heavily focusing on the eyes. And I have to say, this looks very nice. This is by all means better than Kabaneri’s usage of the concept. — As I said before, not much animation goodness in this episode. The action is serviceable, but the thing that stood out the most to me are a couple of horse-riding sequences. They aren’t spectacular, but horses populate the nightmares of animators and this show generally switches to 3DCG when it has to depict them beyond heads bobbing, so it’s neat to see them actually animate these. 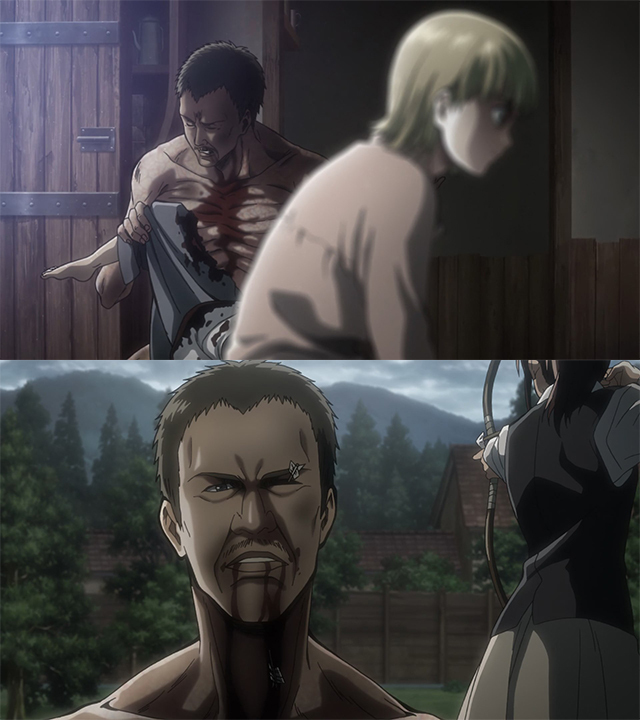 And if I’m going to point out a negative, it would be the scale of the titan Sasha fights. Even taking perspective and everything into account, its size seems…rather irregular to say the least. Much like the questionable sense of space throughout the series, I don’t think they’re very concerned with this kind of thing. Fair enough! It’s just slightly awkward if you’re paying attention to it. 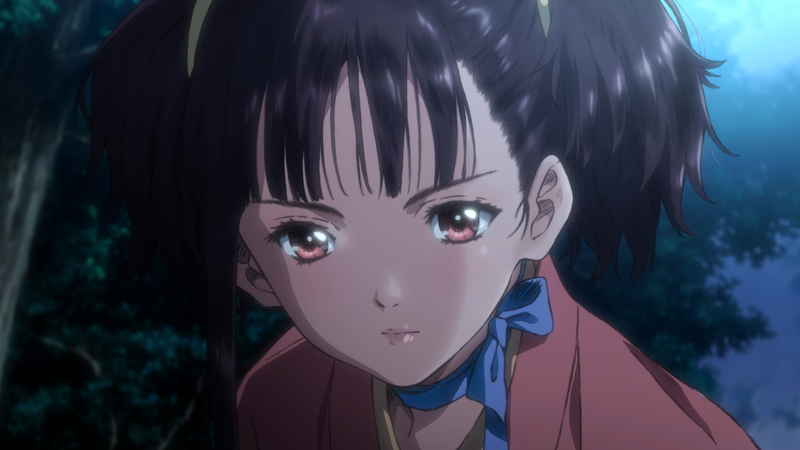 I’ve felt that the makeup animation is a bit more subdued in this new season than it was in Kabaneri, as the contrast isn’t as harsh as it was in the other production. And it looks really nice! Even with those problems, it was one of my favorite features of Kabaneri, at least at the beginning. I have a question. I didn’t notice if it was used for the OVAs, but do you guys think this makeup process will be used for Magus Bride or is it just a thing requested by Araki for his productions? I don’t think so, since it wasn’t present in the OVAs and really seems tied to Araki’s projects. It’s coherent with his bold style that looks for impact, so I wouldn’t be surprised if it never made it to WIT productions he’s not involved with. True that may be, I kind of want to see what a third season of Seraph of the End would look like with this process. Assuming there is a third season, that is. Still, it’s nice to hear the production isn’t a complete mess this time. True, but assuming there’s a third season, I kind of want to see what a “special effect-ified” version of Owari no Seraph would look like. 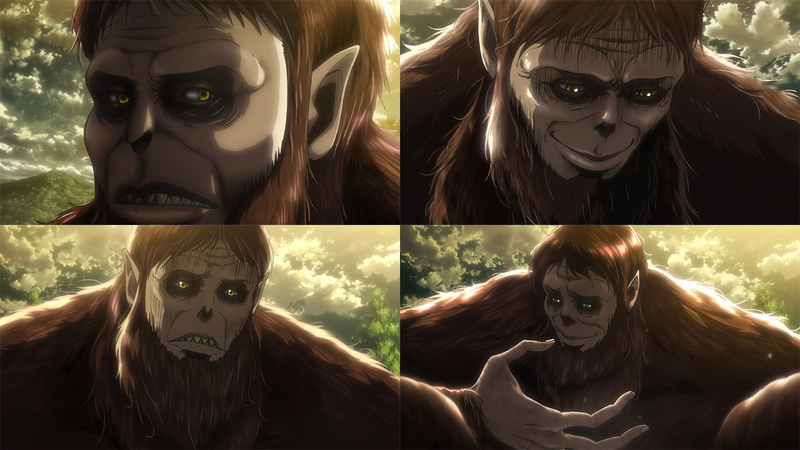 At the very least, it’s nice to see that production on AoT isn’t a complete mess this time around. Could it be related to Mahoutsukai no Yome? I suppose that IG Port would rather focus on their own property with their own crews. My hypothesis is that Mahoutsukai no Yome has been planned to air in Fall 2017 for a long time, and AoT S2 should have aired much earlier. It has been delayed for some reason (I suspect that Kabaneri has been delayed multiple times, which impacted AoT S2’s production) and by the time the staff was able to work on AoT S2, the schedule didn’t allow them to make it two cours. Maybe, MahoYome is a big deal and I.G (plus WIT itself too, though in a *much* smaller level) have invested in it. 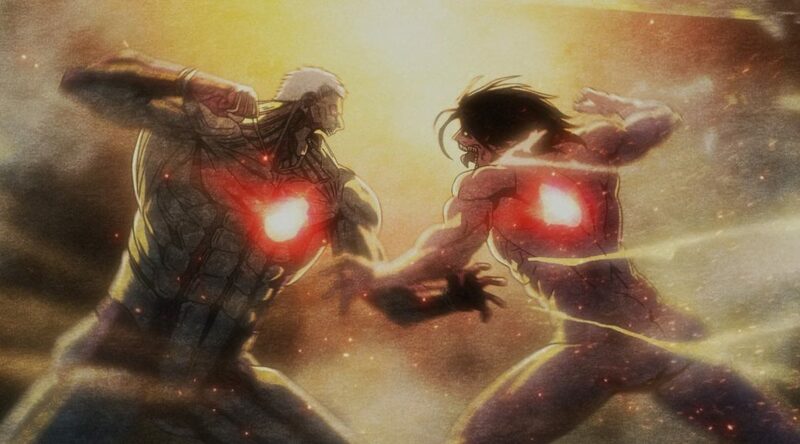 I was actually surprised to notice many animators I would expect to already be preparing that animating for Titans, if it really had been 2 cours it would have been a very messy overlap. In fact, Masashi Koizuka didn’t debuted as Storyboarder on Shingeki no Kyojin #2 and as Episode Director on Robotic;Notes #5, it’s kind a big advance on his career that after being animator on Bee Train and Kinema Citrus during twelve years, just only four years after his storyboarder debut he is doing his full series directorial debut, they clearly have a lot of confidence on him!. Tetsuro Araki doing Key Animation for his series under Saburo Mochizuki should be a funny story to tell someday lol. didn’t debuted as Storyboarder on Shingeki no Kyojin #2 and as Episode Director on Robotic;Notes #5? I got a sketch from Masaaki Tanaka thanks to the Animator Dorm Project. It is great seeing him doing KA now! Ah, so Ebisu handled the throwing scene. I was part of the crowd who thought it was Imai. I’m not as familiar with Ebisu’s style, but it definitely looks like he’ll be a great replacement for Yasuyuki Ebara who left his role as co-action animator. Good to see you around the sakuga scene man! I think most people immediately assumed it was Imai from the PVs, since this is the kind of scene he’s animated many times for the show. And I feel like his influence over Ebisu as an animator is pretty strong as well, so even looking at the drawings themselves you could be confused. People who watched Seraph probably have an easier time telling them apart since that was a very important project for Ebisu’s career. Thanks! Life has kept me busy and sidetracked me for quite a while but I’m hoping to get back into the scene again. Thank you so much for this article ! and all the others one !! You don’t need to memorize every individual artist (especially not when it comes to shows like Titans that so many people have to work on, haha) but eventually you’ll find yourself keeping track of multiple people whose work intrigues you. We all start like that.